DuoTip Markers offer twice the colors — for double the coloring fun! Filled with bright, long-lasting, waterbased inks that are easy to clean up. Ventilated caps. 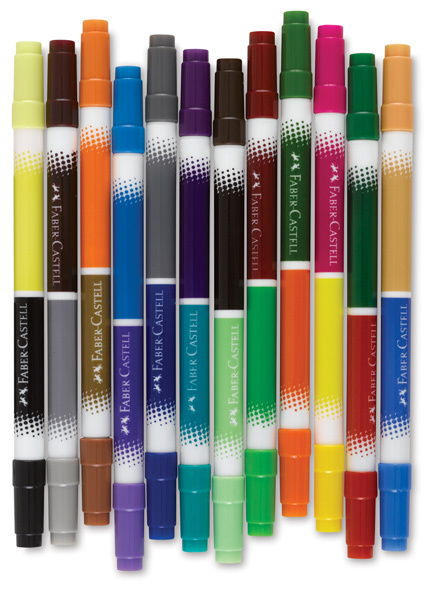 This set of double-ended DuoTip Markers includes the following colors: Raspberry, Emerald, Orange, Forest, Yellow, Pink, Mint, Sepia, Green, Cherry, Ocean, Purple, Denim, Blush, Cobalt, Gray, Lavender, Turquoise, Nut, Peach, Dove, Plum, Black, and Lemon.